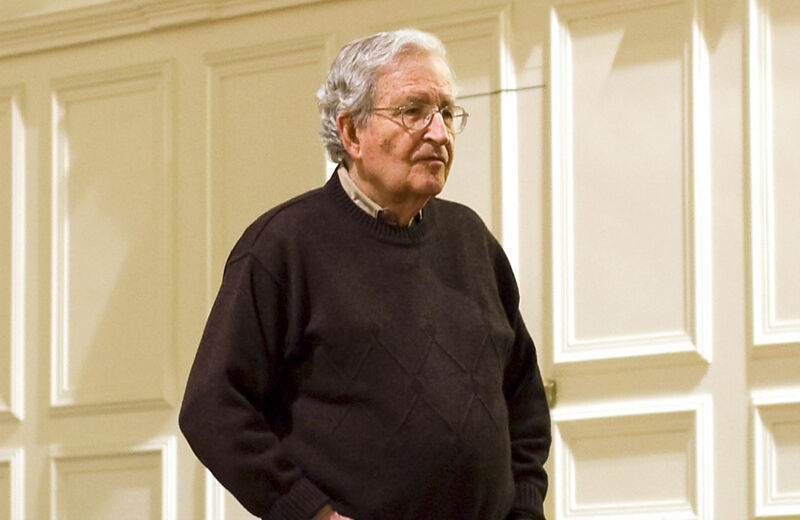 Chomsky discusses the past, present and future of Latin American politics. Its webpage still provides a wide variety of coverage on Latin America and its Report still carries the best writing on Latin American politics. Recently, Keane Bhatt has been trying to keep the liberals honest. But NACLA is in a bad way financially. Please consider subscribing or donating or, better yet, do both. And if you teach at a university, get your library to subscribe. Having outlasted almost as many US administrations as has Fidel Castro, NACLA is needed more than ever. To give an idea of the kind of analysis you would get, below is a repost of an interview I did with Noam Chomsky a few years ago, to celebrate NACLA’s forty-fifth anniversary (check out the table of contents of the issue in which it appeared to get more of a sense of NACLA’s importance). The interview provides a framework for how to think of the escalation of political repression in Mexico today (which Laura Carlson discusses here and Christy Thornton here and here) and the ongoing Central American catastrophe as two elements of a single crisis. Greg Grandin: Your book Turning the Tide: U.S Intervention in Central America and the Struggle for Peace (South End Press, 1985) helped a generation of scholars, activists and concerned citizens think about the regions different conflicts—in El Salvador, Nicaragua and Guatemala—as interlocking parts of a single crisis. You saw in that crisis a turning point in the foreign and domestic politics of the United States, a post-Vietnam retrenchment by liberals and conservatives that led to what you had already started calling a “new Cold War.” The book also presciently predicted, over a year before the Iran/Contra scandal broke in the press, that the Ronald Reagan administration would use “devious means to pursue its war against Nicaragua” in the face of public and congressional opposition. Can you talk about how Central America influenced your thinking at the time about US power in the world, particularly as it followed your involvement in the previous anti–Vietnam War movement? Noam Chomsky: I had been following Latin American crimes closely since the United States effected a coup in Guatemala in 1954, and sometimes giving talks, but later Vietnam displaced almost everything else. In the early 1960s, interest in the US wars in Indochina was so slight that when we tried to organize a meeting about them, we would sometimes bring in Guatemala, Venezuela, Cuba, in the hope of drawing a few people. By the late 1960s, I was very much involved in Middle Eastern issues. In retrospect, I’m sorry that these concerns became so all-consuming that I did not try to do much about the escalating US assault against Latin America: Cuba, the Brazilian coup (1964), the hideous plague of violence and repression that spread through the hemisphere. I began speaking and writing more extensively about Latin America only in the 1970s, then much more intensely as Reagan’s terrorist wars escalated, and also became involved in various kinds of activism. As for what was happening and why, it just seemed to me more of the same, with very deep roots. GG: Turning the Tide paid close attention to what you called “the violence of everyday life,” of poverty and despair in a region that fell well squarely within the US domain. You also juxtaposed that economic misery to the spectacular acts of political repression the region was suffering at the moment, the rampant torture, mutilation, and widespread disappearances and massacres. In retrospect, do you think defending a system that produced such a combination—grinding poverty and extreme terror—forced the opinion-making class in the United States to a new level of double standards or denial? NC: Long before, I had been much impressed with the “revolutionary pacifism” of A.J. Muste, one of the great figures of the twentieth century. I wrote about him in the 1960s. A dedicated pacifist, Muste held that “one must be a revolutionary before one can be a pacifist,” meaning that we must cease to “acquiesce [so] easily in evil conditions” and deal “honestly and adequately with this 90 percent of our problem,” “the violence on which the present system is based, and all the evil—material and spiritual—this entails for the masses of men throughout the world.” So the focus you mention came naturally. As far as I can determine, elites never felt any need to confront the juxtaposition. Terror, by doctrinal command, is something they carry out, not us, even when we are obviously the prime agents. The academic discipline of “terrorism studies” that developed in the 1980s, after Reagan declared his war on terror, labored mightily to find some definition of terror that would keep within the doctrinal confines, studiously avoiding the official US-UK-UN definitions, which have the defect of encompassing our terror and are therefore unacceptable. Work that violates that requirement is effectively banned. As for the misery of everyday life, that is considered either quite natural and insignificant (as in the sadistic observations of Jeane Kirkpatrick that I quoted in Turning the Tide) or else something we had better deal with so as to maintain discipline and control (with more august pretexts, sometimes sincerely believed). There is ample scholarship on this, recently an important book by Nick Cullather, The Hungry World: America’s Cold War Battle Against Poverty in Asia, on aid and development programs. One can properly call the stance “denial,” but it’s not at all new. Perhaps more apt is “intentional ignorance,” Michael Glennon’s term for the dedicated inability of the State Department to see what was happening in Central America in the 1980s. GG: Criminal violence related to the drug war in Central America is skyrocketing. Homicides are way up. There is massive deforestation, driven in many places by the demand for biofuels; intensified corporate mining, including open-pit mining, is poisoning water supplies. Political repression is likewise on the rise, in places like Honduras’s Aguán Valley and in Guatemala’s Polochic Valley. The old Cold War alliance between death squads and a landed class seems to be back in operation, albeit updated: “death squads” are now legal security companies, often staffed with veterans from global hot spots, including former paramilitaries from Colombia, while landlords now receive funding from international development agencies to convert their fields into biofuel plantations to supply the United States with its energy needs. The Central American Free Trade Agreement (CAFTA) has led to rising food costs and the destruction of local markets, contributing to displacement and protest. But these problems are largely treated in isolation, as a series of discrete policy concerns. But is there a way to think of them more integrally in relation to US foreign and economic policy? NC: Among the many operative factors, US policies surely have a prominent place, including the brutal repression of constructive alternatives, the organization and implementation of outright terror, the promoting of corporate exploitation of resources (the population be damned), cultural imperialism in many dimensions and much else. That’s true, dramatically, in each of the cases you mentioned. GG: In a recent interview you gave to Afghan peace activists, you talked about how US wars in Afghanistan, Iraq and Pakistan fit into a “global program of world militarization.” Could you talk about how you think Central America, perhaps broadly conceived to include Mexico on one end and Colombia on the other, fits into the United States’ current regional strategy? NC: Control of Latin America—“our little region over here,” as Secretary of War Henry Stimson described it [in 1945], when he called for the dismantling of all regional alliances while explaining that our own must be strengthened—has always been a core principle of US planning. “Successful defiance” of US policies going back to the Monroe Doctrine was one of the primary charges leveled against Castro in internal documents. When Nixon was plotting to overthrow the Allende government, the National Security Council warned that if we cannot control Latin America, how can we expect “to achieve a successful order elsewhere in the world”: that is, to rule the world effectively. In the past decade, “defiance” has spread through South America, so successfully that not a single US military base is left—even in Colombia, the last holdout, considered secure after huge US aid (keeping to the well-established principle that US aid correlates very closely with severe human rights violations). Hence Central America and the Caribbean gain greater significance. One factor in Obama’s support for the coup regime in Honduras, breaking ranks with most of Latin America and even Europe, was probably concern over the Palmerola air base, called the “unsinkable carrier” when it was used for terrorist attacks against Nicaragua. The bases are no longer justified as defense against Kennedy’s “monolithic and ruthless conspiracy” dedicated to global rule, but on other grounds: often the “war on drugs,” which has little to do with drugs but a lot to do with counterinsurgency and driving campesinos off the land to facilitate mining and other profitable enterprises (something I’ve seen first-hand in several trips to peasant areas in southern Colombia); at home, it has to do with sequestering mostly African-Americans, a population rendered economically superfluous in the era of financialization and the off-shoring of production. This might be considered our more civilized version of our clients’ limpieza social [social cleansing]. GG: As you mention, many countries in South America are gaining unprecedented independence in the realm of economics and politics. In Central America, however, CAFTA has locked the region into the United States’ sphere of influence. But the FMLN now governs in El Salvador and the Sandinistas in Nicaragua. What are the limits and possibilities confronting these two governments? NC: The limits are narrow. They are much weaker than the South American states, and US control is much easier to impose. Still, they are not powerless, particularly with South America moving successfully toward integration and independence for the first time since the European invasions. The newly formed Community of Latin American and Caribbean States (CELAC), including all countries of the hemisphere apart from the United States and Canada, is at least a symbolic manifestation of the options of independence and might prove to be more than that if it can function effectively. GG: Immigration from Mexico and Central America is an issue that, in the United States, reveals the close connection between domestic and foreign policy. Do you see this as one potential source of hope and resistance? NC: To this moment, Mayans are fleeing from the consequences of the virtual genocide of the 1980s, primarily at the hands of José Efraín Ríos Montt, whom the historian Stephen Rabe describes accurately as “the Guatemalan butcher who supervised the eradication of 100,000 mainly Mayan people”—or, if we prefer, a man “of great personal integrity” who was getting a “bum rap” from human rights groups, according to the boss in Washington, whose spirit now hovers over us like “a warm and friendly ghost” in the Kim Il-sung–style renditions of Hoover Institution scholars. The flight of Mexicans was anticipated: Clinton initiated the militarization of the border when NAFTA was passed. It was quite predictable that NAFTA would destroy much of the campesino class, unable to compete with highly subsidized US agribusiness, along with other effects by now well-documented. Immigration follows as night follows day. Much the same is true throughout the region. The consequences of these policies engender conflicts within the United States. Super-cheap and highly vulnerable labor is a boon to business. But it is perceived by the white working class as a threat to its subsistence and cultural values, which are already felt to be under threat for many reasons, even more so as whites will become a minority in the not too distant future. These tendencies are being exploited in ugly ways by political leaders who are dedicated to service to the “1 percent” but need a voting constituency. That’s been the natural decision of strategists for the Republicans, who put aside any pretense of being a traditional parliamentary party long ago, also shedding their moderates. Now centrist Democrats are following not too far behind. There is indeed resistance, a reason for hope, but the prospects will be grim if the US socioeconomic and political system persists in the vicious cycle that became established in the 1970s and escalated since, with a sharp concentration of wealth (increasingly in the financial sector) leading reflexively to concentration of political power and legislation to carry the cycle forward. It’s not inevitable by any means. There are encouraging signs at last of popular opposition, notably in the Occupy movements. But there is sure to be hard struggle ahead.